Like the rest of the nation, Idaho saw manufacturing jobs decline 12 percent from 2006 to 2013. Nationally the loss was 16 percent, and Idaho’s performance may be the result of the significance of agricultural processing in its manufacturing sector. There has been a boom in dairy processing in south central Idaho over the last few years, and food manufacturing continues to have an important presence in other regions as well. Food processing has added a measure of stability in economically difficult times. Regardless of the economy, consumers still need to eat. Transportation costs make it prohibitive to ship harvested crops long distances to be processed, which helps keep food manufacturing operations near Idaho’s diverse farms. Idaho’s construction industry did not fare as well during the recession. It was harder hit than the rest of the nation. Between 2006 and 2013 the state lost 43 percent of its construction jobs, nearly double the national decline of 24 percent. Idaho’s housing boom was concentrated in the Boise and Coeur d’Alene metropolitan areas, spurred by out-of-state speculators. When the housing bubble burst, the brunt of the contraction was felt in those two metro areas, where the depressed economy saw many homes go into foreclosure. Both Boise and Coeur d’Alene still have an excess of existing homes for sale, which has checked demand for new construction. One area industry where the state’s job growth has outpaced the rest of the nation is health care. Employment in this sector, which includes social assistance, grew 27 percent between 2006 and 2013 compared to 16 percent nationally. Recent research has shown that Idaho is undergoing a “Silver Tsunami” – a combination of the aging of its baby boomers and an influx of retirees from other states. Idaho remains a young state compared to others. But it is aging faster than most, and that is creating a greater demand for health care. 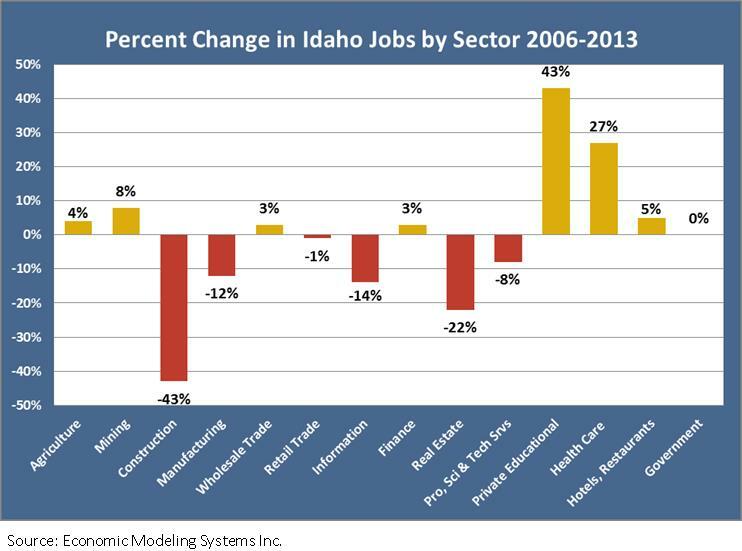 America and Idaho are seeing a recovery of jobs. 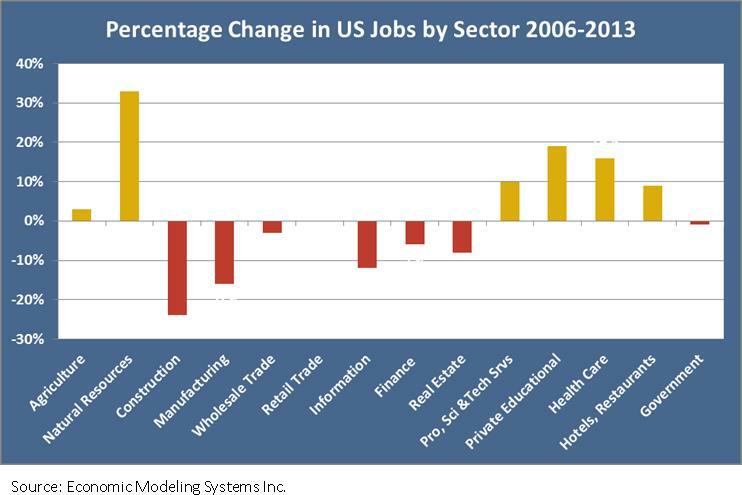 However, those jobs are not entirely in the same industries as a few years ago. Many who once worked in occupations related to construction and manufacturing face a difficult future as few jobs in those industries now exist. Nationally an industry gaining significant ground was natural resources with an increase of just over 200,000 jobs – a reflection of the oil boom in North Dakota and natural gas extraction elsewhere in the country.